by Joanne Asala The ancient Celts celebrated their Sabbats with music, dance, games, food, and drink. Whether you are a solitary practitioner or a part of a larger group, food and drink should always be a part of your festivities, rituals, and ceremonies. This book can be the key to a wide variety of foods that will make you the talk of the town! 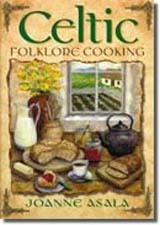 If you are involved in Celtic traditions, this book is a must. If you simply like unique recipes for foods that are as tasty today as they were hundreds, even thousands of years ago, you'll want this book, too.